The health benefits of mineral springs such as those at Bath and Buxton were already well-known in the eighteenth century. As early as 1707 doctors believed that bathing and drinking sea-water also had great health benefits. Between 1789 and 1805, King George III visited Weymouth no less than 14 times for this very purpose to help cure his ‘nervous disorder'. This helped popularise sea bathing and around the British coast villages such as Lytham started to attract visitors in ever-increasing numbers. On Tuesday last at the Kirkham Petty Sessions, the owner of a bathing machine at Lytham, was fined 1s. and costs amounting to 9s.6d. under the Lytham Bye Laws, for taking down three gentlemen to bathe within the limits prescribed by the Bye Laws for females. On Tuesday last, Dr. Bedale, of Manchester, in compliance with his previous announcement, exhibited in presence of several hundred spectators, some of his peculiar and surprising feats in the waters of the Ribble. In the afternoon he proceeded to Lytham to confer a similar-gratuitous treat upon the visitants to that place, - where he would find a wider scope for his skill in “wrestling with the ocean wave." MELANCHOLY DEATHS FROM DROWNING AT LYTHAM. On Sunday (August 1st) last, two unfortunate and fatal accidents occurred in the sea at Lytham, by which two young men, one named John Heskin, piecer in a cotton mill at Preston, and James Mullin, stay-maker, of aged 19 of Thomas Street, Manchester, lost their lives. The ill-fated individuals were bathing at the time; cramp seized them, and they were swept away by the rapid current, and drowned. The bodies were recovered, and an inquest was holden on Monday before R. Palmer, Esq., coroner.—Verdict, “Accidentally drowned." Bathing machines could be hired at the Lytham Beach and some bathing machine keepers even operated a service from the door of the lodging house, through the streets, to the sea shore. 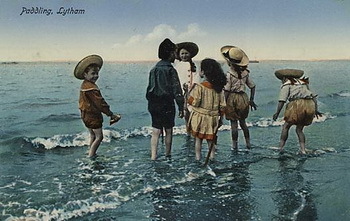 Bathing in the sea at Lytham could be dangerous; there were several deaths over the years. TWO MEN DROWNED AT LYTHAM. A deplorable accident, by which two men, named William Farrow and James Earnshaw, lost their lives, occurred at Lytham on Saturday last. 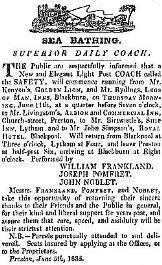 The deceased had come from Oldham by at excursion train, and after enjoying themselves with others for some time in Lytham determined to bathe. Accordingly, about one o'clock in the afternoon, they and two companions, Archibald Booth and James Lees, hired a bathing machine, which was driven into the water. The tide was running out strongly at the time, and immediately the horse had been taken from the machine by the owner, John Parkinson, the van came down what is called the "steep breast" into deep water. Farrow jumped into the water, and was drowned; the other three climbed the roof of the van, but Earnshaw afterwards leaped off into the water with the intention of swimming to the beach, but the current and the ebbing tide were too strong for him, and he was swept back by the retiring waves and drowned in the presence of a great number of persons. Booth and Lees were then rescued by some men who went to their assistance in boats. Earnshaw, a self-actor minder¹, and about 20 years of age, was a single man; Farrow, a carder², was married, and has left a widow and one child. The bodies of the unfortunate deceased were afterwards recovered, and conveyed to the Talbot Arms Inn, where Mr. Myres, coroner, held an inquest on Monday. 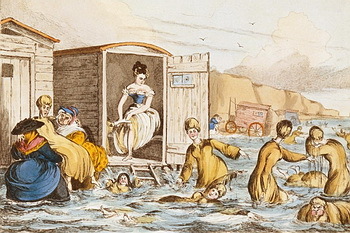 Evidence was given that the place used for men's bathing at Lytham was very dangerous during ebbing tides.--Margaret Candlish, a keeper of bathing vans, said she had nearly lost her life there five years ago, and she strongly urged moving both the men's and the women's bathing places 150 yards lower down the west beach. On Saturday, just before the accident, she had complained of the danger to Police-sergeant Ponsonby, who told her she might remove her vans further west. She did so, and then Jump, a policeman (instructed by Mr. Hayes, a commissioner), told her if she did not replace her vans he would summon her. She refused, however.—Jump corroborated this witness.—The foreman of the jury said he narrowly escaped drowning at the same place about thirty years ago. The jury, in giving a verdict of "Accidental death," declared their opinion that the place for men bathers was very dangerous in ebbing tides, and recommended an immediate change of place, and that, meanwhile, the police should prevent bathing there. ¹ self-actor minder -He w atched and minded the 'Self Acting Mule' - the name of a multi thread spinning machine. The original Mule was hand operated and was invented by Samuel Crompton of Bolton in 1779. It was made self-acting by Richard Roberts in 1830 . ² Carder - He had a skilled job combing cotton or wool.